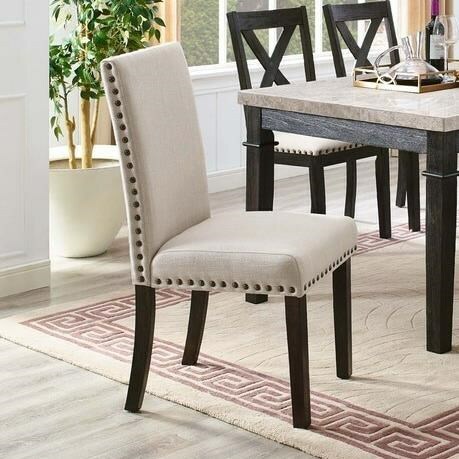 This upholstered dining chair will be a comfortable and chic addition to your dining room or breakfast nook. Inspired from the classic Parson's chair, the upholstered back is slightly curved, matched by the clean curved back legs. 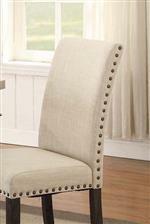 The seat and back are upholstered in a light color and are accented by nailhead trim. Pair this with the matching table and bench for a stylish and updated dining room set. The Greystone Upholstered Side Chair with Nailhead Trim by Elements International at Household Furniture in the El Paso & Horizon City, TX area. Product availability may vary. Contact us for the most current availability on this product. This updated dining collection will be a wonderful addition to your home with a clean, modern design and stylish accents. The centerpiece of the collection, the dining table, has a faux-marble top and a clean dark base. Choose from either X-back wood or upholstered side chairs and a stylish upholstered bench. The Greystone collection is a great option if you are looking for Transitional furniture in the El Paso & Horizon City, TX area. Browse other items in the Greystone collection from Household Furniture in the El Paso & Horizon City, TX area.